Bulb plants perennial toxic whole plant.Six pieces of petals arrive radially distributed in the form of inflorescence.The clumps such as roadside, red-flowered in mid-September, but some white rare.The figure is unique, during the late summer and early fall, height 30 – 50cm scape leaf also branches of also section also does not have projects on the ground, inflorescence wrapped in wrapped in its tip is attached only one.Flowers give a face and broken wraps.There is luster in the dark green leaves. Leaf can be seen during the winter figure, but it withered to become the next spring, nothing is growing in the ground until the fall approaches. Amaryllidaceae is recognized classification system many (new Engler system, such as APG plant classification system), and is a taxon name commonly used, but are included in the lily family in Kuronkisuto system. Western edge of the distribution in the Himalayan mountain system eastern Taiwan is continuous, Ryukyu Islands, Kyushu, the southern Korean Peninsula, Shikoku, and Honshu from so-called South China Yangtze River basin of south China’s Yunnan Province, from northern Indochina, eastern end is the Aomori prefecture (Ungerunia Ungernia genus of closely related are distributed to areas coated. green area surrounded by a red line on the left). In addition, the majority of this distribution area overlaps the laurel forest zone. It is more common in cemeteries and ridges of paddy fields, but it is believed to have been planted artificially in order to:. Animal desolation the field rat, mole, and insects in the former case to avoid the hated poison of the bulb to (avoidance) so, in order to prevent burial and after insect repellent, corpse from being ravaged digging by animals in the latter case. Bulb rich in starch. For lycorine is a toxic component is water soluble, for detoxification is possible if Sarase in water for a long time.Bulb is a crude drug name stone of garlic there is an expectorant and diuretic effect, but the amateur is to use as a folk medicine since it is toxic It is dangerous. Incidentally, galantamine which is one component of the venom has been used as a therapeutic agent for Alzheimer’s disease. Too bad, there is no pictures. The flowers are really beautiful. The flower is beatiful.I like this flower. My local in Kagoshima, this flower was able to look good. Because it grew in the paddy field,I wonder what was planted artificially. I like this flower. But I have never seen this flower in Kochi. So I want to see it next season. I want to watch this flower. 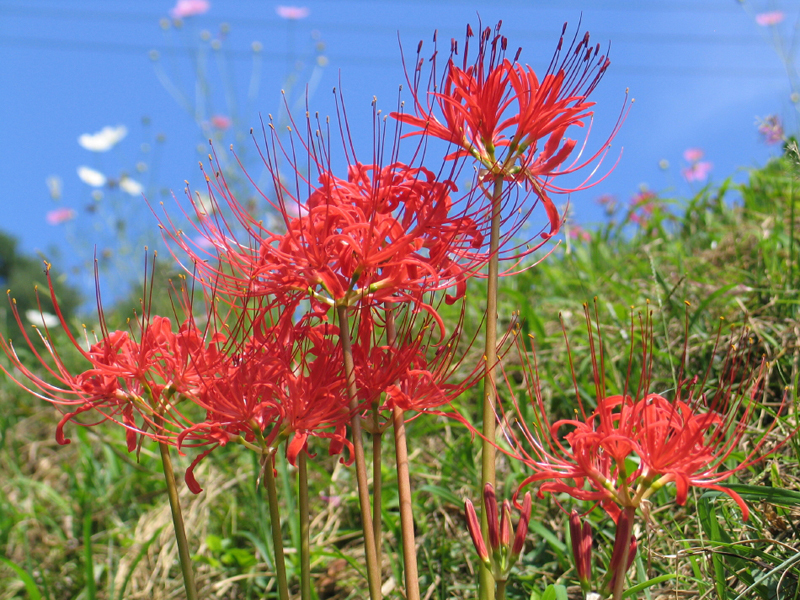 I not knew this flower’s scientific name is Lycoris radiata.